After the huge debacle of the Eroski Shopping Centre project collapsing amidst police investigations of corruption against the former mayor and some of his closest colleagues, news is beginning to emerge that other major brands, namely Lidl and Decathlon, may soon announce projects to establish a presence in the city. The Eroski centre on Avenida Malaga had been intended to house a new bus station, a hypermarket, cinemas, food court, and other retail space, and the project collapse means hundreds of jobs that were to have been created during construction and then as part of ongoing operations have not materialised, leading the current PP/PA government to seek out new opportunities for investment in Ronda. 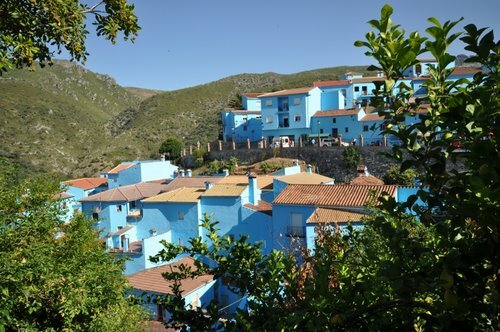 Ronda still does not have a current general plan (PGOU) for urban development, leaving many hoped for projects in a state of limbo, including hotel developments in the Casco Historico, and the much hyped tourist information and welcome centre along the Tajo. Of more pressing concern however is the lack of space within the industrial area for job creating investment. Danial Harillo (Delegado de Obras y Urbanismo) the councellor for urban works has confirmed to Ronda Today that the PGOU is his highest priority, and that in the coming weeks he is hopeful the amendments presented by his team will be accepted by the Junta de Andalucia, and that after a 3 month public consultation it will be possible to sign off on the plan which has been in progress since 1995. Additional zoning for new industrial and commercial developments is to be allocated on land near to the new hospital, as well as expanding the poligono towards the railway line and ring road, both of which would give much needed space for large developments. Lidl had previously expressed an interest in a plot adjacent to the Ford dealership on C/ Rio Odiel, however this now appears to be in doubt. Decathlon had been mooted to be interested in taking control of one of the Supersol locations in the city, and the recent sale of the entire Supersol chain to Lithuania’s Maxima group could yet see one of the two stores close despite assurances to the contrary. 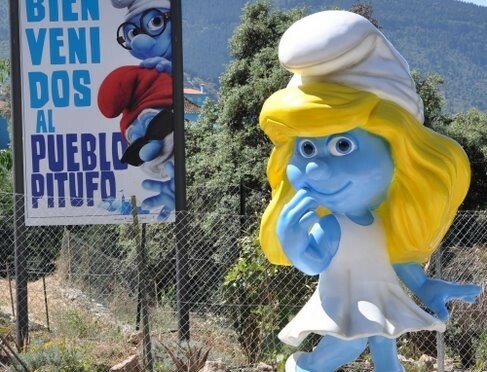 Maxima group had been linked with France’s Carrefour chain as possible new owners of the two stores in Ronda, though it now appears Maxima will start a rebranding exercise nationally after an audit of store performance and customer profiling is completed. 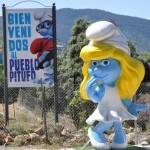 Rumours around Ronda suggest the Supersol on Calle Genal would be the likely loser if one of the stores was to close, strong competition from Aldi and Mercadona having made the store uneconomic to operate, and despite the possible conversion of a vacant lot opposite Mercadona as the new location for the city bus station. In related news, the mayor Maria-Paz Fernandez has confirmed she is keen to close a deal on the location of the old military headquarters in the city on c/ Commandante Salvador Carrasco which would see an underground carpark built along with a cultural centre and outdoor plaza that will likely house a library. Geologists from the Universities of Malaga and Granada in association with experts from Germany have confirmed for the first time the presence of diamond bearing rocks in the Serrania de Ronda. A team of geologists had started a survey of rock formations in the Serrania 5 years ago as part of continuing research into rock types in Andalucia, and two years ago stumbled on small diamonds. Carlos Sanz de Galdeano of the University of Granada explained, “we weren’t looking for diamonds, it was a fluke, but there they were”. The diamonds found are microscopic and for the most part not visible to the human eye, though may still be desirable to commercial miners for industrial uses such as cutting tips or polishing plates. In addition some jewelers use microscopic diamonds joining them together to create small diamonds though pricing is necessarily much lower than a single stone. Two of the locations surveyed showed different sizes of diamond, the first containing micro diamonds hard to see without a microscope, while the second location found micro diamonds visible to the human eye under light. The density of diamonds was much lower for the larger size. 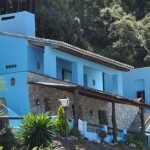 Asked if commercial mining of Ronda’s diamonds would be viable, Maria Dolores Ruiz one of the project leaders, said only that the discovery of diamonds was still in a preliminary stage and that the volume of rock needed to be crushed would be substantial and that only mining companies with experience of extracting micro diamonds would be able to assess viability. As a side note, commercial extraction of micro diamonds has been ongoing in Kazakhstan for many decades, with huge impact on the local environment, and that type of mining in Andalucia may face significant obstacles from enviornmentalists and local government. 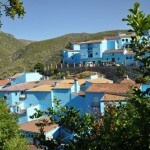 The survey covered the Betica range, which also includes Jubrique to Torrox and passes through the Sierra de las Nieves Natural Park,though it is understood the diamonds discovered were not within the park boundaries. This morning Antonio Marin Lara, and three other PSOE councillors Francisco Cañestro, Rafael Lara, and María José Martín de Haro were arrested and will be charged with corruption and money laundering offences. Agents from the National Police division, the Unidad de Droga y Crimen Organizado (UDYCO), the drugs and organized crime unit, this morning arrived with warrents to arrest the four former councillors at the offices of the town hall and the Office of Urban Develepment, both of which have been registered as crime scenes. 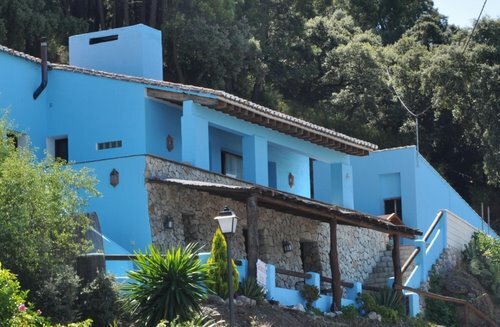 The investigation against former town councillors has been ongoing for more than 12 months with specialist agents drafted in from Malaga to collect and assess evidence against the accused. Ronda Today understands that all charges will likely be related to urban planning discrepancies. This morning staff arriving for work in both of the offices affected were prevented from entering the premises as further police arrived with large numbers of empty boxes to remove files and documents. Police have confirmed that they will be widening their investigation and that the private homes of the accused will be sequestred to collect further evidence. Court approved wire taps have been used, and police say several other people, including civil servants and private citizens will be questioned with possible further arrests. Update 12pm: The regional PSOE-A of Andalucia moved this morning to suspend all four of the accused, meaning that their seats in Ronda’s town council will shortly be filled by other list candidates from the recent municipal elections. Update 3:30pm: A further three people have been arrested and will join the first four detained in Malaga where all will be formally indicted in court. The police have further announced that crimes being investigated also include forgery, malfeasance, destruction of evidence, and bribery. 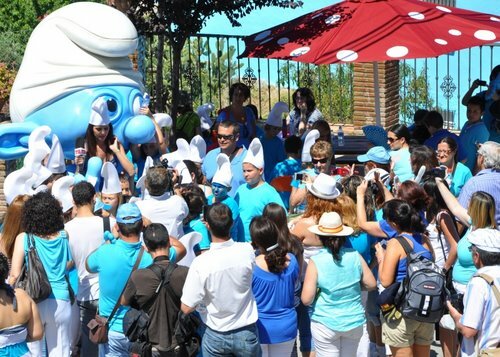 Sony Entertainment, the producers of a new film “The Smurfs 3D” recently chose Juzcar in the Genal Valley as the global launch party location, hosted by Spanish model Eva Gonzalez. 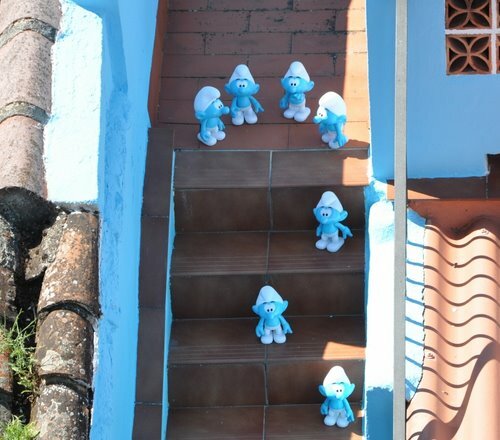 The village was chosen because of its connection to the smurfs in the form of being home to over 150 varieties of mushroom, and since the Smurfs live in mushrooms, Sony’s Spain director Ivan Losada explained the village was absolutely perfect. 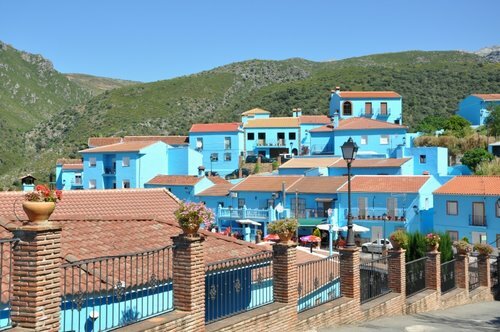 Almost every building in the village was painted Smurf blue, with many in the village now calling for this to be the official colour over the village permanently, instead of reverting to the white typical of Andalucia’s pueblo blancos. 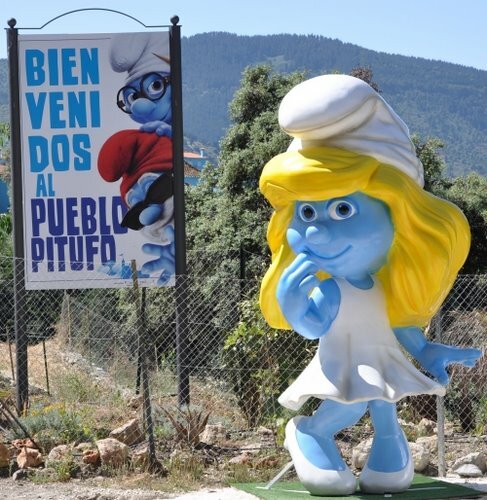 Villagers and fans crowded into the town square to be seen with Ms Gonzalez and the lead Smurf characters, Smurfette, Papa Smurf, Gargamel, and the cat Azrael. 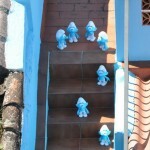 Children from the village were encouraged to wear Smurf hats and paint their faces blue. 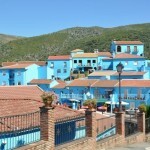 Around 4,000 litres of the special Smurf blue paint were used, with all residents unanimously voting to approve the change in a local referendum which expires in September, though mayor David Fernandez indicated under questioning that if changing the colour to blue substantially increases village tourism that keeping the colour could be extended.